When we have an idea in mind that we wish to turn into a real, tangible and above all sustainable project, we might encounter several difficulties and without a method and some useful tools, this can actually affect our attitude and make us feel blocked or even like giving up. Whether it is a business project or an action plan to start a business or a marketing plan, we should always design a detailed working plan before venturing into a no return path. For this reason, we suggest five useful steps we might take to realise our ideas. At the beginning, our idea seems comprehensive, feasible and ultimately perfect, the best idea that our brain could conceive. However, the reality is very often quite different! We feel strong and believe that our intuition works impeccably as it is just the perfect idea for us. Unfortunately, others might not find it interesting and therefore it may not respond to a real need. Moreover, we might be too superficial: we have a light-bulb moment and that is fine. However, many people have winning ideas and perhaps at that very moment other people have had the same intuition somewhere else in the planet. What will make the difference between them and me? Well, it will be the working plan, the strategy that I will adopt and my ability to realise that intuition. Which needs does my product / service meet? What are the characteristics of the target market? In short, we need to study and carry out extensive daily researches to avoid mistakes that could undermine our idea since the very beginning. Once we have been determined the characteristics of potential customers, it is appropriate to create a prototype of our product / service and test it with friends, relatives and people close to us who may have identical or at least similar characteristics to the target audience identified. 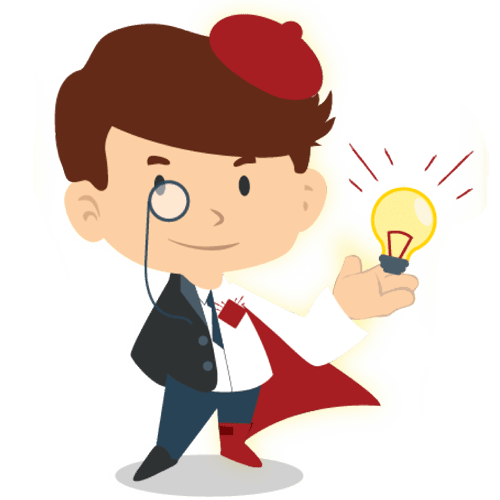 In short, we shall develop what in English is called the Minimum Viable Product (MVP), an early version of the product / service that envisages an interaction with our target market since the idea comes up to our minds. This system is useful not only to validate our idea, but also to perform a quick initial and low-cost test enabling us to assess what we are doing and decide whether to continue or change our minds. Once we have concluded this first test of our prototype obtaining the answers we were looking for, we shall continue with the modeling of our product / service, by applying the appropriate changes to propose a new version of it, which summarises and maximises the information learned directly from the client (tester). In this third phase, we shall investigate and work on possible revisions to be applied to our product / service, by asking questions and, if necessary, repeating the test. We may also contact the first potential stakeholders to verify whether they may be interested or may wish to give us valuable advice. We might devote a lot of time to these first three steps. In fact, the market and target audience analyses, the realisation of the prototype, the testing and the necessary changes may require months of work. For this reason, it is crucial we always keep an eye on a scheme highlighting the important steps we are taking to achieve our final design. The Idea Design Process is a useful model that helps us track each step and decide when the idea is ready to move on to the next step: click here to download it. the financial strategies that we can potentially implement. This fourth phase also requires in-depth studies and analyses, revisions of the idea and comparisons with external parties: it is at this stage that the Creative Project Canvas can be a useful tool to realise our project. This is a proper canvas where we can “paint” the contents of our business project and enrich it with any kind of details. It will allow us to visualise all aspects of our idea in a comprehensive as well as context-aware manner and will help us to present it to our potential travel companions. Click here to download the Work (Play) Book, the guide to use the Creative Project Canvas. Click here to download the Creative Project Canvas. begin to take our first steps towards the promotion and sales of our product / service. Thus, let us implement our idea and start a true sustainable business project. Realising our ideas as well as finding ways to make them economically viable can often be problematic for many of us. These five steps can help you to understand many things and first of all the utility and feasibility of your plans, disregarding mere aspirations or accompanying you throughout the realisation of our greatest desires. To do this, the Work (Play) Book will definitely help you and will support you to define and implement your idea as well as to develop it when it is a real and tangible product / service. 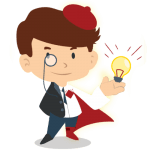 Creative Project Canvas is a useful tool for artists and creators to elaborate, clarify, evaluate and reflect on past, present and future projects, products and services. 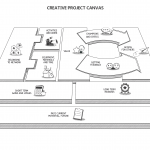 Creative Project Canvas is for artistic and cultural practitioners who are based on Business Model Canvas, a business tool used by companies all around the world. 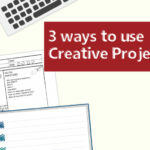 Creative Project Canvas and Work Play Book are the tools of European project Break in the Desk co-funded by Erasmus+ Programme of the European Union.